“The day of days, the great day in the feast of life, is that in which the inward eye opens to the Unity in things*,—” In those few words Emerson told what he had discovered, how it happened, and how it felt. Those words could have been written by Beethoven, by Leonardo DaVinci, by Steven Weinberg in his red Camaro discovering the unification of forces, or by someone doing such a mundane thing as looking for mineral deposits. As a mineral exploration geologist, I spent a career thinking about discovery: what it is, how it happens, and how it feels. Now I try to find the same rewards in poetry, because each new combination of words which works is a discovery. Something new is discovered in words which were there all the time. Of course, it only works on rare occasions. Proust said: “I had arrived then at the conclusion that in fashioning a work of art we are by no means free, that we do not choose how we shall make it but that it pre-exists us and therefore we are obliged, since it is both necessary and hidden, to do what we should have to do if it were a law of nature — to discover it.” And Proust speaks of analogy as pointing to the essences of things; and of “the miracle of analogy.” These are concepts at the heart of scientific discovery. When I read Keat’s “On First Looking Into Chapman’s Homer” I know that it is describing the feeling I had when I first made a discovery of a hidden likeness, and this makes me think that the moment of discovery in the arts and in science is the same. Almost hidden in Yukawa’s explanation is the word “happens.” But in it is the world of creativity. It signifies a chance combination of ideas. The similarity is noticed suddenly, by chance. Two things that have not been thought of in the same context are seen to be alike. In Marcel Proust’s In Search of Lost Time the narrator toward the end of the book discovers the “miracle of analogy,” that analogies point to the essences of things, something that would have been familiar to Yukawa. In fact, the reader finds that it is this that has made possible the writing of the 4000 or so pages he has just read. And so, the miracle of analogy, so responsible for discoveries in science, is responsible also for this book, called one of the greatest literary achievements of the 20th Century. The likeness showed me how. The poem “The Turquoise Sea” begins as a description of an actual exploration project. The idea is proposed that what we are looking for is an ancient shoreline. This idea first comes to someone almost as a revelation; someone has looked at the rocks and has said, ”I am looking at an old shoreline, and it is in it that I see evidence of what I am searching for.” But it is almost all deeply buried. Exploration proceeds by drilling holes and recognizing land in some holes and off-shore in others, in this way defining the ancient shoreline along which to explore. At the end of the poem an analogy is made between space and time, and this analogy is said to appear suddenly, for in fact, that is how it happens. In the poem “The Castaways” it has been realized that the gold deposits occur at the contacts of accreted terranes, pieces of Pacific seafloor and islands that have been jammed onto North America, overriding or sliding under the rocks already there. In the early 1950’s a U.S. Geological Survey geologist pointed out that small uranium deposits on the west side of the Black Hills occurred at a color change in the sandstones containing them. The uranium was depositing where the environment was changing from oxidizing to reducing. This became the basis for much of the exploration during what was called the uranium boom. Eventually, it was found that the largest and richest deposits in the world were at the greatest oxidation/reduction boundary, that which happened 2.5 billion years ago, when the atmosphere changed from reducing to oxidizing, a likeness that probably wasn’t recognized until after many of these large deposits had been found. The first hidden likeness shown to me allowed us to draw circles on a map of Wyoming, circles around areas which could be targets. The first one we drilled became a new mining district. That determined my career: not the mining district, but the emotion of the hidden likeness. It may have been among the very first signs that mineral deposits could be found without surface evidence. Where did that song come from? Do we have to have seen Dr. Zhivago to know it is a love song? Where does music come from? Two nights ago I was at a street festival in Cedaredge. A little thirteen-month-old girl was dancing in time to the music. Barely able to walk but keeping time to the music. What is hidden inside us to make that possible? Frost said a poem is when an emotion has found its thought and the thought has found its words. Music must be even deeper: when sound has found its emotion. What first brush stroke, first blow of the chisel into the marble, first working of the clay, first notes of a song or words of a poem might be the “explosion of a hidden likeness”? Had I not had the opportunity to look for uranium deposits or gold deposits or the like, I might never have encountered that phenomenon; and the feeling of “the heart missing a beat,” in science and in poetry. I know of no poem that shows the discovery of a hidden likeness better than this one by Verity Martin, my Verity. She called it Petal Fall. She had to know something about apple trees to know they sometimes blossom in the fall if under stress. And she had to know something about an old woman. And love. But to put them all together! blossomed, blossomed in a fairy froth. a shower of petals falls softly. And last, for Margaret, my partner in discovery, in America and Australia, in science and in poetry, part of a poem by the Australian poet, Henry Lawson. 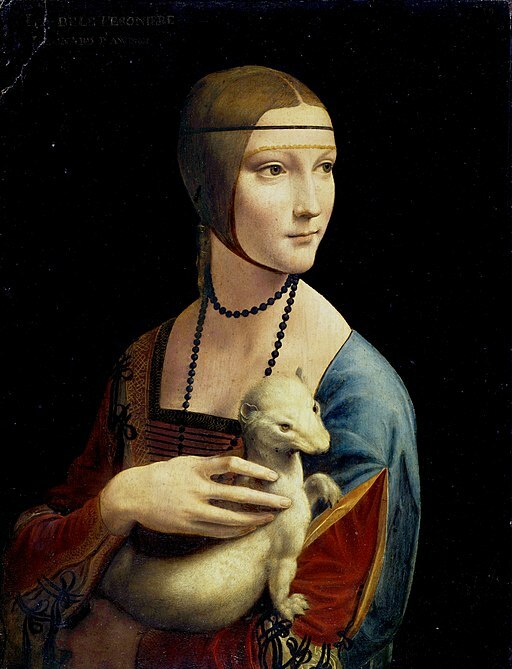 The frontispiece is The Lady with an Ermine, by DaVinci. It was stolen by the Nazis during World War II and recovered at the end of the war by American soldiers. Posted on September 2, 2018 by Phil. This entry was posted in Uncategorized. Bookmark the permalink.